Jock Ferguson (AUS) and Niamh Crehan (IRE) give you an insight into their third week here on the Irish National Stud Thoroughbred Breeding course. The foaling unit continues to rise in its number of foals this season with the addition of two smashing foals who arrived with the help of fellow students Ryan, Connor, Tyler and Niamh who were on foal watch throughout the week. 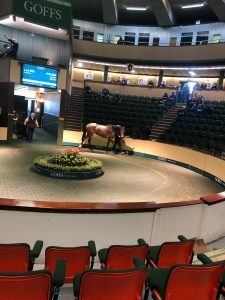 The students received their second assignment which involved the students attending the Goffs February Sale and selecting either a young yearling to pinhook and re-sell at the September/October Goffs Orby sale or a broodmare prospect to add to a broodmare band. Joey Cullen Marketing Director of Goffs was on hand to guide the students and to also give them an insight into bloodstock sales. With the breeding season starting in a few days, students were given an induction on covering in the breeding shed and the stallions are all prepared for a busy season ahead. As spring is coming into play, the days are starting to get longer and the weather is warming up. Down at Maddenstown the maiden and baron mares are starting to come into season and are cycling more frequently and will be ready to for covering very soon. The Stud and Japanese gardens re-open this week to the public so it is sure to be an increasingly busier week for all at the Irish National Stud especially the restaurant staff who will be ready to serve the visiting customers.